I was excited to see this issue has one of my favorite artists, Olivier Coipel. Coipel was the first, and I think, the best artist of the current “X-Men” comic when Brian Wood launched it. He has a style that should appeal to many: it’s fluid, more soft and rounded than David Lopez’s, but not as flowing as Dexter Soy or Emma Rios. My favorite panels in this issue are when Miles Morales and the Ultimate Universe’s Jessica Drew are standing in a rainy graveyard. I wasn’t sure if I would like the Cindy & Peter relationship, and I’m still hesitant. As an Asian American women with a media studies background, I’m well aware of pop culture’s love affair with White Savior Syndrome. (Don’t get me started on “The Last Samurai” or “Pacific Rim.”) When Cindy first shows up here in Peter’s apartment, the scene is cute, and Cindy isn’t afraid to speak her mind: she tells Peter that he should move out. Cindy’s agency quickly evaporates for a moment, though, on the very next page: she says to Peter, “I — I can’t explain it, Spider. I just woke up thinking about you. And only you.” Gag. Are you serious, Dan Slott? Even soap operas don’t write lines that bewilderingly bad. This needy puppy dog side to Cindy better disappear before her solo title begins in February. Then on the same page, Cindy again tells Peter that he should really move out, and that she should be the Spider-hero who’ll fix things. The conflicting polarity of Cindy’s statements is jarring and takes the reader out of the moment. Coipel does fans of Peter’s more superficial qualities a favor: in a role reversal of typical comics art, he focuses the body part baring on Peter, not Cindy. We get a glimpse of Peter’s bare rear end, skillfully semi-covered by a word bubble. I’m so happy that Cindy doesn’t need a revealing costume to earn attention as a memorable character. 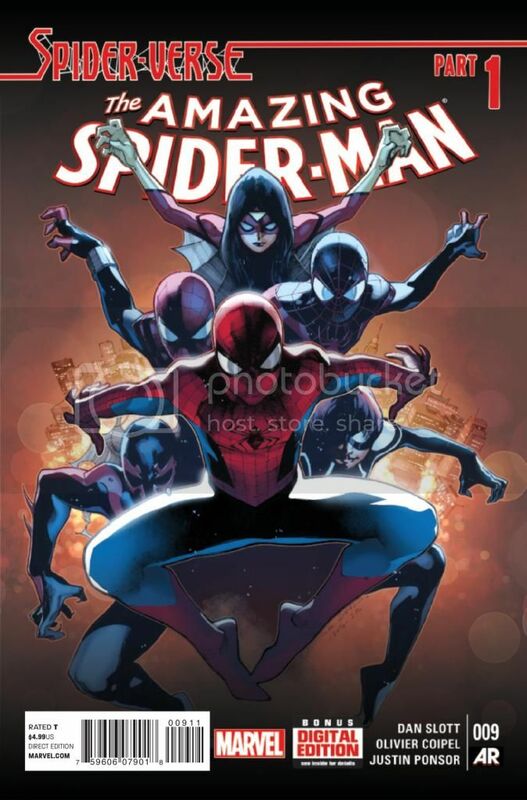 It begins to feel like a flash mob when Jessica Drew, Anya Corazon, Miguel O’Hara, Billy Braddock, and Mayday Parker all show up on the same city block. It’s the first moment when this issue is actually funny. It only gets crazier from there — more Spider-People from other dimensions gather at a massive meet and greet in one Earth’s Central Park. I’m not a fan of the Morlun premise of this whole Spider-Verse event, but it is fun to see these different Spider-characters interact. I just wish they could meet under different, Morlun-free circumstances.